Thanhouser Career Synopsis: Frederick B. Warde, a well known stage actor, joined Thanhouser in November 1915 and played a number of important dramatic roles in the company's films through 1917. Biographical Notes: Frederick Barkham Warde was born in Wardington, Oxfordshire, England on February 23, 1851, the son of Thomas and Anne (Barkham) Warde. Educated at the City of London School, he intended to become a lawyer, but a stage career took precedence. Warde made his debut on the boards at the Lyceum Theatre, Sunderland, England, where on September 4, 1867 he played the Second Murderer in Macbeth. From there he went to the Theatre Royal in Glasgow, Scotland where he played 80 different parts in nine months. Later, he was seen in Manchester where he made the acquaintance of playwright Dion Boucicault, who encouraged him to go to America. In 1871 he married Annie Edmondson, an English actress (who died in 1923). Warde's debut on this side of the Atlantic occurred on August 10, 1874, in the role of Marston Pike in Belle Lamar at Booth's Theatre, New York City. He remained at Booth's as a leading man for three years, appearing with such notables as Adelaide Neilson, Charlotte Cushman, John McCullough, E.L. Davenport, and Lawrence Barrett. He then went on tour with Edwin Booth. A Contract Breached: In 1881 Frederick Warde commenced playing leading roles in his own company, after which he negotiated an agreement to appear under the management of John J. Collins. On August 1, 1884, Collins, of Cleveland, Ohio, published the following notice and distributed it to the trade: "To Whom It May Concern: On or about September 1st, 1881, I entered into a contract with F.B. Warde, by which he bound himself to play under my management for the term of four years. Under the conditions of the contract he was to receive the sum of fifty dollars per week (aside from personal expenses) for the maintenance of his family; which sum was to be deducted from his share of the net. We have been associated in this way not quite three years, and during that time he has received several hundred dollars more than the above stipulated amount and is now largely in my debt. All the conditions of my contract with him have been faithfully fulfilled, and I have at all times stood ready to carry out my obligations to him for the full term. I have kept him before the public as a star in tragedy, uninterruptedly for the greater part of three theatrical seasons. "On the 8th of March of the present year, at Reading, Pa., this man left me without cause or notice - though announced to appear at Easton and Pittston, Pa., Ithaca and Syracuse, N.Y., in succession - with a company on my hands, to struggle out as best I could. Taking advantage of my being in the city of Syracuse, he served me with notice to appear [before the court to dissolve the contract]. [Through a legal action I] have asked that he be prevented from acting with any other person, in a business way, until my just dues are settled. I therefore give warning that this man Warde is totally unworthy of confidence in any business transaction, and utterly devoid of honor or business integrity. Further, I will proceed against all persons employing him as an actor during the existence of this contract." "On September 9, 1901, Mr. Warde inaugurated his 21st tour, and besides reviving four old successes - King Lear, The Mountebank, Julius Caesar, and Virginius - he will produce a new classic play entitled Horatius, which was written for him by Miss Verna Woods, of Sacramento, California. Horatius is highly spoken of for its literary merits; it is founded on the legend of the Horatii and the Curiatii in ancient Rome, about 600 B.C. On many occasions Mr. Warde has delivered addresses on Shakespeare and other dramatic subjects to the educational institutions of the country. In fraternal circles, Mr. Warde is a member of the Lodge of Elks and the Knights of Pythias. He is a man much beloved by the members of his own profession and holds an honorable position in private life." Warde's Stage Career Continues: From 1893 to 1903 Frederick Warde appeared jointly with Louis James, after which he played Matho, with Kathryn Kidder, in Salambo. In May 1904 he filed a petition in voluntary bankruptcy in the United States District Court, Brooklyn, citing accumulated debts from a series of unsuccessful theatrical tours as the cause. "Made almost a nervous wreck by the importunities of his creditors, Warde took advantage of the bankruptcy laws," his attorney stated. By July of the same year, his finances must have improved, for a press release noted that he had been signed to give a series of 30 lectures per year, and he "has purchased a tract of land up in Sullivan County, New York, 10 miles from the nearest railroad, and will build a handsome residence there, finding a seclusion which appeals strongly to him after his long years of activity under the public eye." During 1905-1906 he toured with his own company in Shakespeare's The Winter's Tale and other plays. In later years he played in such productions as The Lady of Lyons, The Count of Monte Cristo, Chesney World, Brunhilde, and Mary Stuart. In the summer of 1909 he conducted The Frederick Warde Institute of Oratory, Expression and Shakespearean Study at the mansion on his 30-acre estate, Wardesden, at North White Lake, New York. At the time his business address was 240 Westminster Avenue, Brooklyn. Assisting him were his sons, Ernest as "stage instructor" and Arthur as business manager. 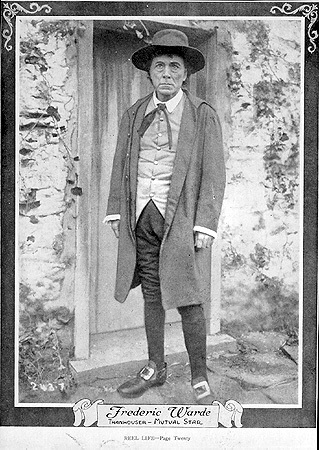 In the summer and autumn of 1910 he toured the South with his own Shakespeare company. By the end of October the troupe, which had played to disappointingly small audiences, had run out of funds and was forced to cancel several engagements. Seven members of the company, representing about half of the players, deserted in Jacksonville, Florida to return to New York on a Clyde Line steamer. Into Films: The September 11, 1912 issue of The New York Dramatic Mirror stated that at the time Warde had been off the stage for several years and had devoted his time to lecturing on Shakespeare. He appeared in a much-publicized film of Shakespeare's Richard III, produced by M.B. Dudley and directed by James Kean, scheduled to be released by the Richard III Film Company on a states rights basis on September 15, 1912. The release was later rescheduled to October 15th. The company, which apparently realized the limitations of its corporate name, changed its designation to The Shakespeare Film Company, and from offices at 815 Longacre Building, 42nd Street and Broadway, New York City, announced that Richard III "will be followed by Macbeth, Othello, Hamlet, and probably King Lear." Promotion and distribution of the Richard III film was continued in 1913, when it was handled by Clarence Weis and Max Plohm. Subsequently, the film was advertised by the Sterling Camera and Film Company, New York City. An article in The New York Dramatic Mirror, October 2, 1912, told of the production of this film: "It is expected that the M.P. Dudley Amusement Company will be able to announce the release date of their feature film, Richard III, within a few days. Work has been progressing rapidly at the studio near City Island. Two more important scenes remain to be taken, the landing at Richmond of the head of the army, in which is used a real 15th century type warship, especially constructed, and another scene depicting the Battle of Bosworth Field, in which hundreds of soldiers are apparently seen to be engaged and Richmond is slain. Frederick Warde, who appears in the leading role, has declared much enthusiasm for the film." More on the same subject appeared in an article in The New York Dramatic Mirror, November 13, 1912: "Frederick Warde, the veteran Shakespearean actor, is reported to be extremely proud of his accomplishments before the camera in a motion picture production of Richard III. In a recent interview, printed in the Brooklyn Eagle, he said: 'I simply had not realized before what a great thing moving pictures have become. They are admittedly becoming a great educational factor all over the world, and especially in France the actors as well as the plays have reached a high standard and have enlisted the services of real artists. Another thing. Shakespeare's plays can, with a little skillful handling, be made into very effective photoplays. The great plays are so full of real meat that they are wonderful in any form, and it is possible with the camera to get effects on the screen that cannot be realized on the stage, visualizing as never before pictures that have been left to the imagination. Of course, to make certain things comprehensible without the voice and lines it is necessary to interpolate certain incidents to show the motive, but the bard himself would hardly object to this. "'The staging and methods of the moving picture people, however, were revelations to me. I thought I knew all the tricks of acting, but their work was simply amazing to me, and I shall never forget my first experience. The pictures of Richard III were taken on the grounds of Judge Carey's place on City Island. The ruins of the house were transformed into settings for the different scenes, the cellar of the house being used as tower dungeons and other things. The director of the company simply told the other actors what to do, telling them when to look glad or sorry, when to shout and when to fight, without telling them why they did any of these things. It was another matter for me. I simply couldn't act without saying my lines, and I had to suppress all sense of the ridiculous to go through with the thing in such surroundings.'" With Thanhouser: An article in The Moving Picture World, November 20, 1915, told of his coming to Thanhouser. As he had been in films earlier, his comments concerning the initiation into the mysteries of films were misleading: "That eminent tragedian and Shakespearean authority, Frederick Warde, has at last succumbed to what he jokingly terms 'the film inevitable.' He has just been engaged by Edwin Thanhouser, the Wizard of New Rochelle, and will be first seen as Silas Marner. Mr. Warde is practically the sole survivor of the Shakespearean actors of another day.... Of moving pictures, he says: 'A wonderful art to which I am a total stranger but an ardent admirer. Little did I think that I would ever take part in a studio production, but the spirit of the time and Mr. Thanhouser's proposal bade me give ear to the 'film inevitable.' My initiation into the mysteries of the film studio proves to me that I am not too old for new tricks.'" He subsequently appeared in Thanhouser's Silas Marner, released on February 19, 1916, followed by King Lear and other productions through 1917, all of which featured him in publicity and advertising. 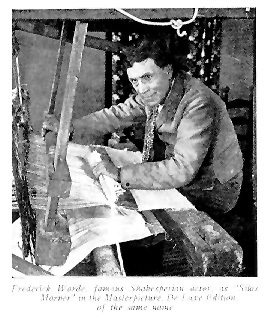 In his book, Fifty Years of Make-Believe (1923), Warde devoted two paragraphs to his Thanhouser involvement: "The moving picture industry was growing rapidly. Mr. Edwin Thanhouser, president of the Thanhouser Film Corporation of New Rochelle, made me the offer of a year's engagement to appear in a number of pictures under the direction of my son [Ernest C. Warde], who had become quite an efficient director. The offer was liberal, and the association exceedingly pleasant, and the results very satisfactory. "We made pictures of Shakespeare's tragedy of King Lear, George Eliot's novel of Silas Marner, Goldsmith's The Vicar of Wakefield, and several modern subjects, all of which were popular successes. The leading characters gave me an opportunity to utilize the experience of so many years upon the stage, while the liberality of the arrangement and skill of the director enabled me to appear to the best advantage, and the work that at first was not entirely to my liking became agreeable as the possibilities of the camera became apparent." He was the author of at least one other book, The Fools of Shakespeare. "'It is!' someone insisted. 'You said something then,' said someone else. ' - a decade from now,' Mr. Warde continued. 'It would be merely a curiosity, valuable only as rare antique.' Here was a famous actor who took a new view of motion pictures. Most of those who have had great success upon the speaking stage consider that they step downward when they enter the films; they patronize the art and their apology for entering is that they 'owe it to coming generations' that their wonderful histrionic abilities shall be inscribed in celluloid. "'Acting? Some of it. In the first place it probably would have been a one-reeler - in two reels at the most. The photography would not have been so good. It would have been as out of date now as a 'sky-scraper' built 25 years ago. What has become of the picture Sarah Bernhardt made some years back? It is lost - lost because the methods of production are antiquated, not because of any fault in the acting. I didn't go into motion pictures to perpetuate my art. I am in the films because motion picture actors can live at home, because motion pictures are made upon a larger scale than is possible upon the stage, and because they test an actor in the most difficult of all arts - pantomime. I have not left the stage for good. I expect to return, for the spoken drama is my first love. "'I am told that so-called 'costume pieces' are in disfavor among the motion picture patrons. Yet I appeared in Silas Marner and I understand it has been a success. They tell me that King Lear is, as they say, 'going to go big' and we are now at work upon The Vicar of Wakefield. I think that perhaps the aversion to costume pieces is caused by the fact that so few of them are based upon a genuinely human story. You can spend thousands of dollars to please the eye, but unless you please the heart, unless you create human sympathy, your play is a failure. My hobby always has been worthwhile plays, and I have found that no play without heart interest ever was worthwhile. I find that I can exercise my hobby to greater advantage and with more personal comfort through the medium of the screen. So here I am. But to perpetuate my art? Bosh!'" Warde's Later Life: Frederick B. Warde acted in the March 1919 World release of The Unveiling Hand, and appeared in films with other companies through at least the mid-1920s. He died of heart trouble in Brooklyn, New York on February 7, 1935, at the home of his daughter, Mrs. May Schmitt, 1720 Ditmars Avenue, Brooklyn, New York. He was survived by his son, Arthur Frederick Warde, and two daughters: Mrs. Schmitt, and Mrs. John J. Hillgardner, of West Hempstead, New York. Services were conducted on February 9th at the Fairchild Chapel, 86 Lefferts Place, Brooklyn. About 50 friends and family members attended. His two sons were each in motion pictures. Ernest was with Thanhouser, as noted. In June 1916 his other son, Arthur F. Warde, was press agent for the Rosegraph Film Corporation, which was set to produce Queen of Roses. Note: Frederick Warde is not to be confused with Fred Warde, a French vaudeville agent who was buried in Pere la Chaise Cemetery in Paris. Nor is he to be mistaken for Ferdinand Israel, who used the stage name Fred Ward, and who filed bankruptcy on January 22, 1909, at which time he was a resident of the Hotel Bayard in New York City.